Programming notes: The Page Theater emphasized a quality family-friendly environment with their slogan being “Southern Oregon’s greatest place for amusement”. 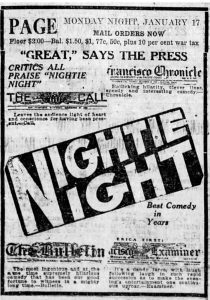 However, they did feature some controversial films including works of D.W Griffiths, Sapho, and Nightie Night. 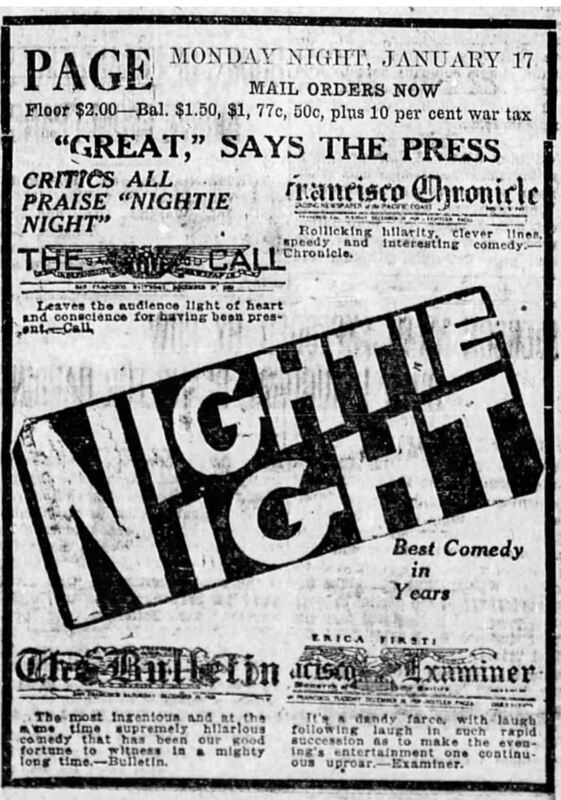 Promotional strategies notes: The theater features a vast array of designs for films in newspapers featuring anything from graphic design, photographs, to sensationalist summaries. These advertisements were featured next to each other in the Mail Tribune. They both have a focus on the visual aesthetics, the unique graphic design for Broken Blossoms draws the eye. 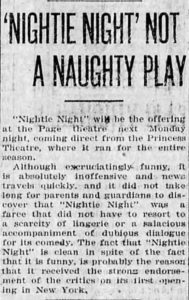 The Page theater showed several of D.W. Griffith’s works including Birth of a Nation and Intolerance in 1916. The deep influence the KKK had in Southern Oregon at the time likely had a hand in the director’s popularity. Watch Your Step was Irving Berlin’s debut musical debuting four years earlier. This was not likely to be the original cast, but was still likely a live touring performance that made its way from New York to Medford. This advertisement and this article were published in the same paper on the same day. 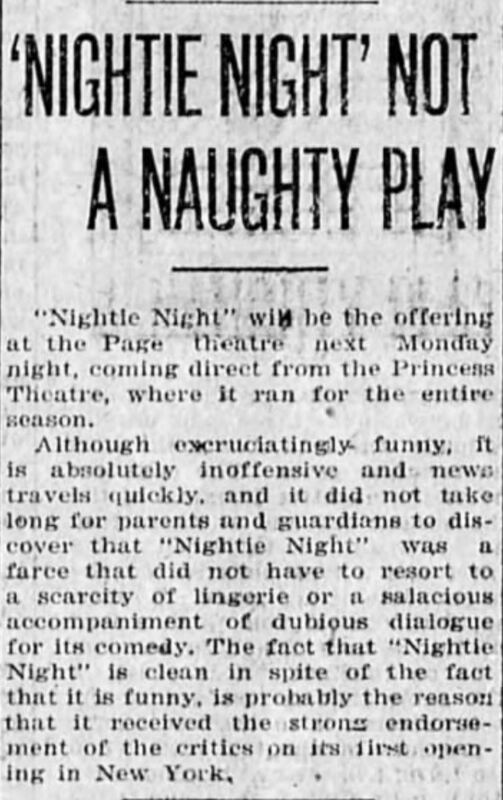 The article addresses community concerns about the film, defending the morality of it claiming that Nightie Night is “absolutely inoffensive” and “clean in spite of the fact that it is funny”. This defense of a film is not a regular occurrence in the Mail Tribune, so the question is why did The Page feel the need to defend this film? 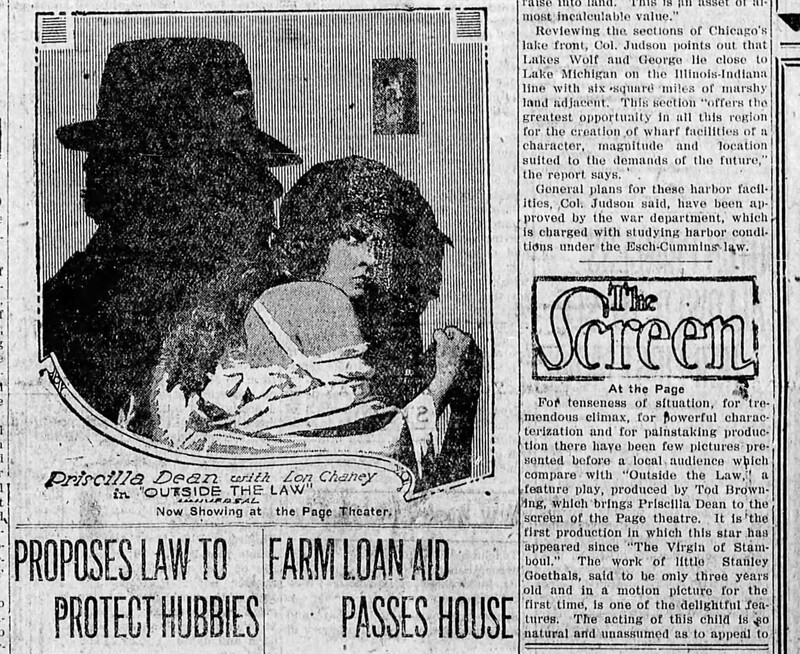 This advertisement features this large artistic photograph and a small article describing the film. Both aspects of it use sensationalism. The photo showcases Priscilla Dean’s expressive face and an imposing shadow. 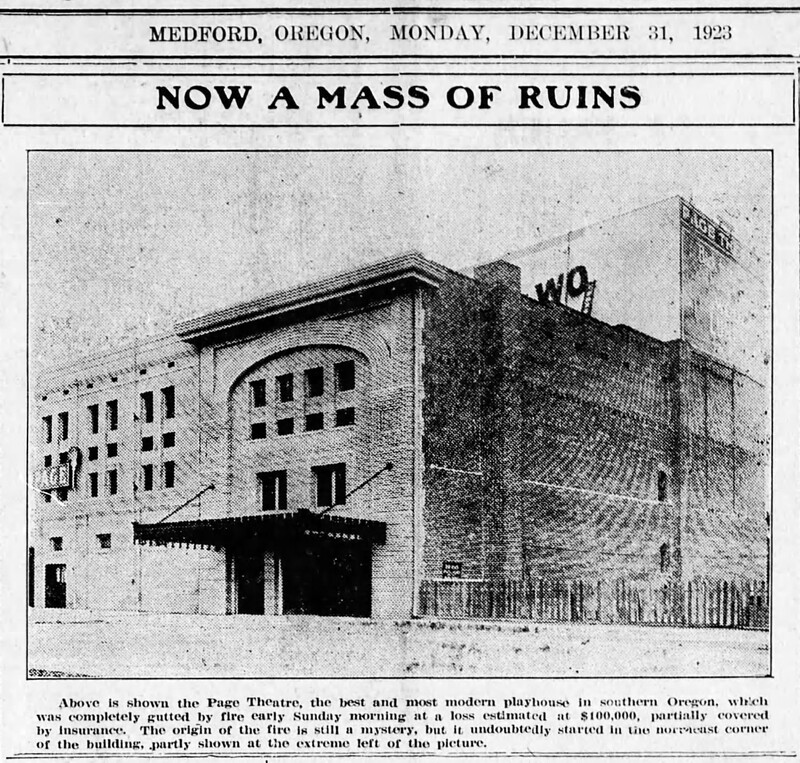 It was rare in Medford for photographs to be featured in newspapers during this time in part because the newspaper didn’t have a photographer for several years. So something this large would draw the eye. The article claims that “few pictures presented before a local audience compare with” the characterization, climactic nature, and production value of this film. It claims this film is utter perfection. “The accomplishment extraordinary” that is 20,000 Leagues Under the Sea is another example of the Page theater advertising films with sensationalistic language. 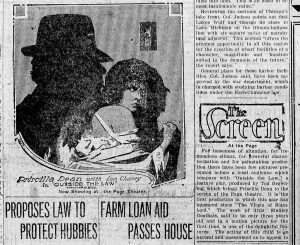 Sapho is a film that features a female lead who is “essentially sensual in a manner to make her appear almost spiritual at times” and it is one that was censored in other counties in Oregon because of the intense sensuality. However the page took a risk and showed it in the conservative environment that was Medford, Oregon in 1917. 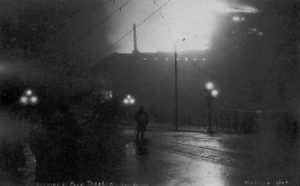 On New Year’s Eve in 1923 the Page Theater went up in flames and was permanently closed after. There was one death, a volunteer fireman who was crushed by a falling wall. His name was Amos Willits and he was a loved and involved member of the community. The cause of the fire rremains unknown. The parentage and reason for leaving the baby behind still remains a mystery, as the Mail Tribune never covered the story after this point. 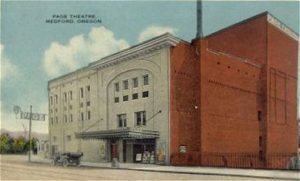 The theater would work to maintain good relations with the community, giving them what they want. 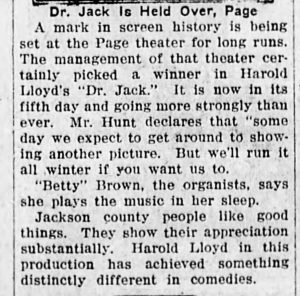 It was common for theaters in the area to only show a certain film for a few days in a row, then they would shift over to a new film. 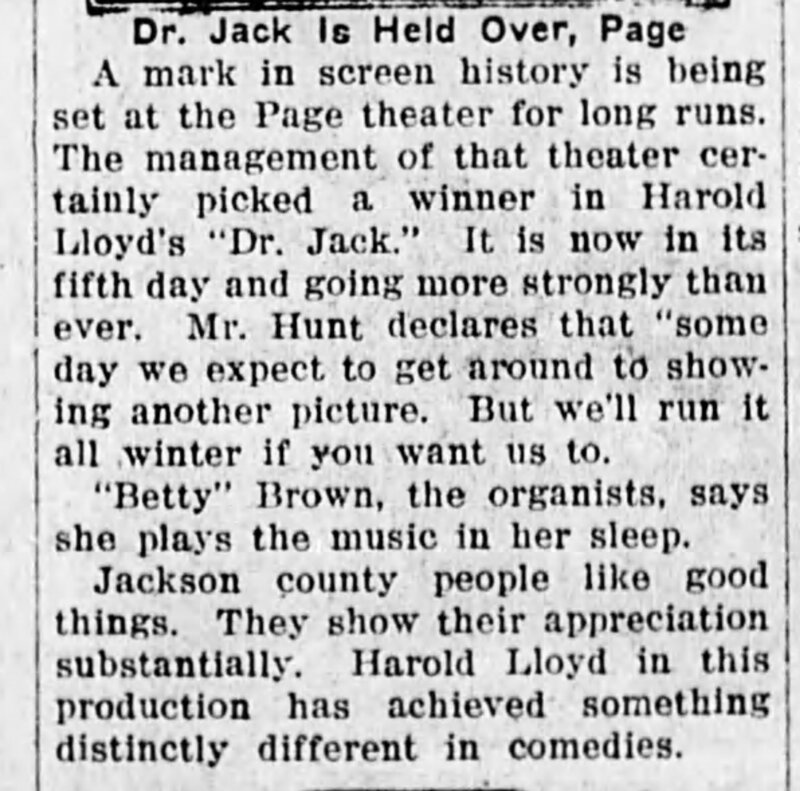 The Page chose to extend their showing of Dr. Jack because of the sheer popularity of the film.